These laser etched stone plaques are made from the same Absolute Black Granite as our sand blasted plaques. 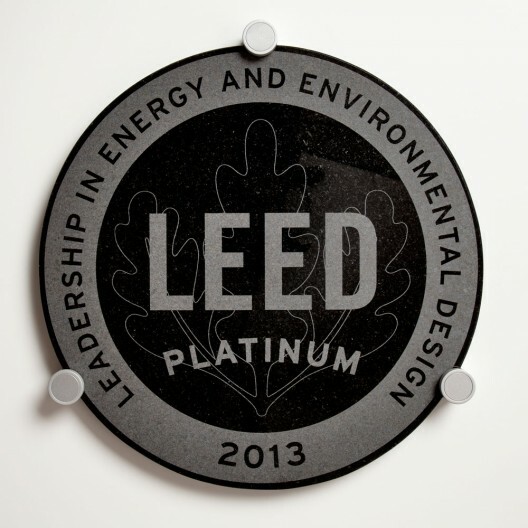 The year and level of your LEED Certification and the USGBC seal is laser etched on the face of the stone. You may choose a honed or a polished finish for your plaque. These laser etched plaques are available in a 5", 8" or 16" diameter. We offer a variety of mounting brackets and plaque stands which are sold separately and can be found in our hardware section. Please contact us for more information regarding custom options.